This two ply EcoSoft Green Seal controlled use tissue features the newly patented OptiCore two part core technology. 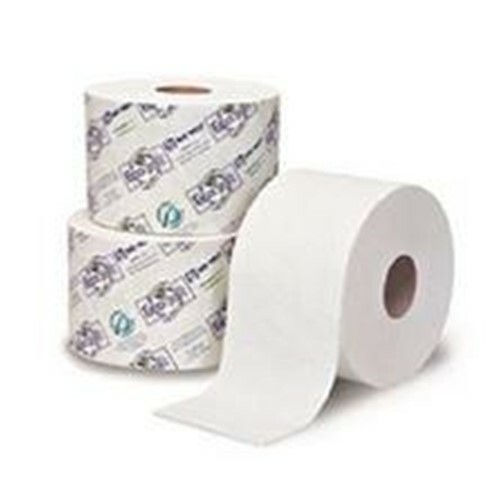 When combined with the coordinating Revolution and Dubl Serv dispensing systems, ensures maximum use of each roll in the dispenser thereby reducing waste and cost. This quality tissue is 100% recycled and exceeds EPA guidelines for post consumer waste. The paper is embossed and made without de-inking and bleaching processes or other harmful chemicals. Even the packaging is environmentally preferred. This high capacity EcoSoft Green Seal tissue is designed for those seeking to achieve green status for their facility and purchase tissue produced with methods less harmful to the environment. Sheet size (inch): 3 3/4" x 4"